Our Mission is to Inspire Hope and Encouragement to Everyone We Meet! Larry's book is now available for delivery on Amazon.com. Click picture to order. Larry Cockerel on, Someone's Passenger in Life! Have you ever experienced that special time when you realize your purpose in life is to be someones passenger? Let's define "passenger"; you're riding along in the passenger seat of someoné else's life situation. This someone could be a loved one, spouse, child, friend or co-worker. There you are and you realize that you're in the seat, your purpose is to just to ride along, offer encouragement, inspiration, or just a shoulder to lean on. February 13, 2013 I found myself in that seat, after many visits to the Cancer Clinic with my best friend, wife and business partner Debbie, that "AHA" moment hit me head on. I realized that my purpose wasn't to drive, direct, talk, be the center of attention, no, it was just to be Debbie's passenger in life, along her Cancer journey. The date was her pre-surgery visit, surgery number two, in that split second I came to the realization of my purpose that day, just to be her passenger. The passenger, rides along, listens, shares, but also realizes that they aren't the driver, they are the friend, the ride-along, the encourager. That day I realized again, that Cancer teaches us much about life, love and giving. It also has taught me about purpose, living in the now, and that ones purpose maybe lived in the moment of a situation, and event in life. Have you ever found yourself in the passenger seat in someone else's life? Where your purpose was to just ride along and offer hope and encouragement? If so enjoy the moment and understand that your life purpose is playing out right in front of your eyes! Debbie, Pre-Surgery Day. Me, I'm just the Passenger in Her Life Today, My Purpose to be the Caregiver, the One offering Encouragement and Hope! We all can be someones passenger in life, everyone needs someone! 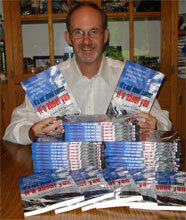 Larry Cockerel offers Motivational and Inspirational Keynotes to help people live life to their greatest potential! Discover how you can invite Larry to your next event or conference to inspire and motivate your people. Fighting Back. Never Giving up. When cancer comes a knocking, you suit up for battle, gather your team, your "Cancer-Fighting Team" at home, as well as work and your Physician Fighting Cancer Team. Know you're ready to fight back. Everyone has a story, my story. A 4 year "Cancer- Fighting Speacialist" winning my battle daily, and a "Cancer- Fighting Caregiver" to my best friend, wife and buisness partner, Debbie. Together we fight again! As we shared in our first book; It's not about cancer, it's about you; six reasons to keep living and enjoying your gift of life, attitude is everything, never give-up and most important, conquer your dreams. If cancer is in your life in any way, you or someone you know or love, suit up for them and help them fight back. Through your encouragement, love, friendship and hope. Everyone needs someone, everybody can help somebody, and cancer can teach you about enjoying the gifts of life. Our mission is to offer hope and encouragement to everyone we meet! Cancer isn't the end, it can be the new beginning, it will change you, but it's how you choose to look at the change that makes the difference. Take on the thinking; cancer may have me, but I don't have cancer, and I'm going to fight back hard and strong, with all my power, faith, love and hope. This is the attitude I hope for my readers, fighting back is okay and change is okay! There can be a win everyday, it's all in our attitude! Get Your rear In Gear walkon Oct. 12, 2013, funny same as Debbie's birthday, we did the walk and guess what? She won a door prize! Never let what you think should hold you back, hold you back, change your thinking and you change your destiny! Larry Cockerel offers inspirational and motivational keynotes, on overcoming obstacles and living you best life to your greatest potential. Larry shares his story with cancer at ACS Relay for Life events at no charge. Sticking to his purpose and mission, to offer hope and encouragement to everyone he meets. Making a Difference On Purpose! There is nothing greater than being able to share your message of hope and encouragement with others. This is what we do! We had the opportunity to kick-off the first American Cancer Society's Relay for Life for S.E. Wisconsin in March 2013 with our message of "Never Giving Up" and Keep Living and Enjoying Your Gift of Life. When you look into the eyes of those listening and you can see the connection, you know then you made a difference on purpose! Two Cancer Survivors on a mission to offer hope and encouragement to everyone we meet! Allow us to make a difference at your next conference or ACS Relay for Life! Me 4.5 years and loving life! Debbie, almost 1 year from 2nd occurance and surgery and loving life! We share what cancer has taught us about facing our moutnian in life and getting over it, and to keep moving and living life. Have you thought about the value of listening lately? Not just listening but the value of listening, the benefits for you and the one you are communicating with are unlimited. There is a difference in listening and understanding the value of listening. The value you gain from sincerely listening with your heart as well as your mind is transformational. Learn The Value of Listening for yourself. Something Cancer has taught us is that the value of listening to each other at a deeper level helps to fight the cancer with faith over fear. Great news! You never know how far a relationship can take you. So knowing that I highly recommend being considerate and nice to people. Most people care about other people and have a true desire to make a difference. Have you ever had one of those "chance" meetings that changed your life? I have, and call this a "Purposeful" meetings now, and allow me to share why. I don't want to think of things that change the direction of my life as "chance" I would rather take the attitude that these meetings are "Purposeful" we just may not know at the time. In my short video I share a piece from my book; It's not about cancer, it's about you; six reasons to keep living and enjoying your gift of life, about a meeting I had with a friend and a colleague by the name of Robert. What was suppose to be about a meeting of my next step into the roll as President of our National Speakers Association of Wisconsin, this "Purposeful" meeting changed the direction of my life by helping to direct me to my "Cancer-Fighting Team" at UW Madsion. Just so happen that his wife worked for the Head & Neck Surgeron at UWM for 14 years and I had this big tumor growing on the side of my neck. After many visits at other clinic's and hospitals that left me confused and lost, what was to be a professional meeting turn into the "Purposeful" meeting of my life! That meeting helped me discover the team that I needed to fight my cancer. Have you ever had one of those "Purposeful"meetings that changed your life? Sometimes it doesn't happen that fast, but you never know. So as your journey moves forward think of every meeting as a "Purposeful" meeting meant to encourage, inspire and help someone you may know along their journey in life, cancer or no cancer. My mission is to offer hope and encouragement to everyone I meet! Larry offers inspirational and motivational Keynotes to help inspire your people at your event to live their life to their fullest potential. Discover how you can invite Larry to your next event or conference. With the New Year here, many new doors will open for the opportunities to offer hope and encouragement to everyone we meet. Our mission is to encourage and inspire others to enjoy their gift of life and live their life to their fullest potential daily. As two Cancer-Fighting Specialist on a journey to share what cancer has taught us through our books and inspirational and motivational keynotes. What appeared to be the worst thing that could have happend to me 45 months ago, helped to prepare me for my partner, best friend and wife (Debbie's) cancer journey today, 222 days as of date fighting her good fight for life and to celebrate many more birthdays with me! We all have a story to share that can inspire someone somewhere to reach for their greatest potential in life. Allow us to help inspire your people at your next Relay for Life Event, Cancer Survivor Celebration or Conference. We all have a race to run in life, make it you best at all that you do! The Faith Department....When you need it most! With Debbie's cancer treatments and team, we ended up at the "Faith Department" at the Cancer Clinic, the one thing that Debbie may have needed the most, FAITH! Faith and Hope, two ingredients that help us along in life, help us reach our potential, fight our battles and in my case and Debbie's, win over our cancer. I read once that God will only send your way what He knows you can handle, and in Debbie's cancer battle it just so happened to be Faith and Hope. See for yourself! On this wonderful day of December 4, 2012 I called this day "Good News" day, scan results after 10 months of cancer treatment, look good! Faith and Hope, Never give-up, no matter what life brings your way! My best friend, wife, and business partner Debbie found her "Faith Department" just when she needed in the most! Have hope and find faith my friends and enjoy your gift of life! Find out how Larry can share his story of encouragement and winning over your obstacles in life to live your best life for your next event. Do You Have Faith? - A Lesson In Life From "Honey"
Yes your "Best Days" are in front of you, they are waiting for you, it's going to be GREAT! As a cancer survivor and a cancer caregiver, I can tell you that your best days are in front of you, because what's happened is in the past, it's behind you! We can only go back in our mind, feelings and thoughts, what's in front of you is going to be much better. As a 42 month cancer survivor and a 182 day cancer caregiver to by best friend, wife and business partner (Debbie) we know about not living in the past. All those radiation treatments, chemotherapy sessions, surgeries are ALL behind us, we know our best days are in front of us, it can only get better. This has got be our attitude, it doesn't pay to stay in the treatments, it doesn't pay to have a "poor me" mindset, no, life doesn't get better living in the past. Sure we are realistic people, yes the cancer could come back, but we're not living our life that way, no we're living our life to our greatest potential. No matter what you're facing in life, whether cancer, loss of loved one, loss of job, no matter what, you do have a choice, and that choice is to believe that your best day's are yet to come. it's just a choice. Here's what we've found; "Nothing happens to me; it happens for me"
We are not defined by our past, we are prepared by our past, for our best day's to come! We hope through these 2012 Holidays, that our readers will discover the power within, to get living and enjoying your gift of life. We hope that you enjoy your family and friends like you've never done before. We hope that no matter the size of your mountain that you maybe facing, believe that your God is BIGGER and GREATER! We believe that our book: It's not about cancer, it's about you, can help to encourage you or someone you know facing a tough time in life. Our book is about what cancer taught me about facing my giant in life (cancer) and moving forward, knowing my best days are in front of me! FREE shipping for the Holiday days. "CHEMO" Day....it is what it is! Hello my name is Larry also know as The Cancer-Fighting Specialist, 42 month cancer survivor, today a 111 day cancer caregiver to my best friend, wife, business partner and love of my life-Debbie. Daily we understand the meaning of burning bridges, crossing bridges and building new bridges, something that cancer is teaching us daily. Allow me to share a few bullets with you. Burning Bridges; after each completed treatment, surgery, medication we hope through faith and luck this stage of fighting cancer is a bridge we burn. Crossing Bridges; chemo day, radiation treatments, surgery, fear, guilt, these are bridges we cross over to victory in our life. Building Bridges; this is the growth that we gain through our daily victories, the new relationships that build, hope for tomorrow, encouragement to others through our experiences, these are bridges we build for a better tomorrow. "CHEMO" Day, the bag....this is a bridge we are currently crossing that in time will be a bridge we burn, a victory, a story, another chapter in our life, an experience to share and offer hope and encouragement to others. Allow us to offer our story for hope, encouragement and a better life to your team. Two travels along life's journey, two people seeking purpose, hoping for a good life. Two travelers complimenting each other, helping each other, supporting each other and loving each other. Two cancer survivors, enjoying our gift of life, each other. Life can bring about some pretty mighty, scary and life threatening storms, cancer being one of them. As a cancer survivor and now a cancer caregiver to my best friend, I'm discovering that life is truly about others, helping them, encouraging, offering hope and a shoulder to lean on in troubled times. We all face a storm in our life, and in many cases more than one, when the storm is coming your way I believe the first thing we think about is others, those we love and care about. And then the storm passes, we hold each other, we cry, we laugh, we live again! Our mission in life is to offer hope and encouragement to everyone we meet! Cancer has taught us that life is truly about living, but most important, living for others, helping, inspiring and adding value to others when we can. We do our best to offer inspiration, hope and encouragement through our programs and books. if you're thinking about bringing a speaker to your next event, why not give us a shot, I offer my "Customer Excellence Guarantee" 100% satisfaction or you pay no fee. Check us out, and let us know your thoughts and plans so that we can customize the message to meet your theme and purpose or mission. The Cancer-Fighting Specialist and best friend, business partner, marketing director and now a cancer survivor (Debbie) contact Debbie about booking us for your next motivational keynote. We believe success follows happiness, be happy then all the things in life will follow you! Acknowledging a Cancer Survivor, A Celebration of Life! Everyone's journey is different but then there are the common links that bring us together. These common links have many names, titles and causes, they also offer opportunities to encourage others, share and celebrate life. In every journey, there are small victories, obstacles that teach us how to love life and the true meaning of happiness. As a cancer survivor and now a cancer caregiver, what seems to be a major obstacle and opportunity in life becomes a bridge to help two people understand the true value and purpose of their relationship and mission in life. Hello my name is Larry, we all have a story, my story a 38 month cancer survivor, my life today, a 20 day cancer caregiver, my hope for tomorrow, that we all celebrate life daily! I've found that no matter how tough life gets, it's the choices we make that make us, our attitude about our situation and how we choose to respond to the challenge we face. Debbie and I have a mission and that is to offer hope and encouragement to everyone we meet, through our story, our books and our passion to share and inspire others. Please help us add value, serve and share our message! Hello my name is Larry, I'm a 3 year cancer survivor, and now I've been blessed with the opportunity to be a cancer caregiver to the one I Iove. Yes "blessed" maybe, just maybe, my cancer journey 3 years ago (2009) was to prepare me for Debbie's cancer journey today, as I write on this day May 27, 2012, day 2 after a 7 hour surgery. Day 2 is a celebration of life, day 3 and all the days that await us are celebrations, and it's our purpose to enjoy our gift of life with those we love, work with, know, network with, no matter the relationship, I see it as our duty to inspire and encourage others. As The Cancer-Fighting Specialist my mission is to offer hope and encouragement to everyone I meet, now it's everyone we (Debbie & I) meet. Debbie being my marketing director and a darn good one at that, helps me get my message of hope and encouragement through my presentations and our book. As we move forward she will have a story of hope and encouragement through her recovery and victory over her cancer and together we will celebrate life offeing inspiration and encouragement to others. My message today is "Let's Celebrate Life" every day, no matter how bad the weather is, what side of the bed you woke up on, what the doctor say's, who likes you or dislikes you, today I give you permission to celebrate your life daily. June 8 I will sahre this message at a (American Cancer Society) ACS Relay for Life Keynote in Tomah WI. My Debbie will not be able to be there with me helping me share and get our book in the hands of other people, but her heart will be with me, we almost become like one, I will have a picture of her first walk (small steps to victory) with me to share. Please take a minute and tell yourself today that you're going to "Celebrate Life" every day moving forward, your choice, your life, make the best of it, so you can become more for a blessing to others. We all have small steps to take along our journey in life, it's always best when you can take them when you know you're helping someone else discover their own powerful potential to live, and keep moving forward! The Cancer-Fighting Specialist and his Marketing Director, Cancer Survivor Debbie. April 24, was my birthday, but now as a 3 year cancer survivor I celebrate my birthday everyday, the celebration of life, what it offers me and how I can give back and encourage others. Live like it's your Birthday every day! 2011 Relay for Life, Marshfield WI. We shared our story to hundreds of survivors ans caregivers! Are you conquering your dreams today? If not, make the decision to make it your life plan to live the dreams that are possible for you to live! Chapter 1; it's not about cancer, it's about you, #1 reason to enjoy your gift of life, conquer your dreams! It's not about you, but those you love; from cancer survivor to cancer caregiver, new book coming out fall 2012. It's all about living a thoughtful, thankful and faithful life, and making your life about encouraging and inspiring others! March 26, 2012 last day of Radiation Therapy! We made the first stage to recovery and winning the battle with Cancer, Debbie is on her way. it's takes courage, faith, hope, love and a passion to live. Debbie was om my Cancer-Fighting Team 3 years ago and now I'm the director of her Cancer-Fighting Team, life gets funny like this! On this day, March 26, 2012, Debbie completes Radiation Treatment #28, no easy task, it takes courage, faith, hope, love and and a amazing strength that sometimes we don't realize we have. If you're reading this and have experienced cancer, radiation, chemotherapy or know someone, a loved one, then you can relate. It takes your "Cancer-Fighting Team" to help you along your journey, I know, I'm a three year survivor as of April 17, 2012, now I walk the path of recovery with Debbie my love of my life, marketing director and best friend. Our mission is to offer hope and encouragement to everyone we meet, and through others. We offer our story of inspiration through our first book; It's not about cancer, it's about you; six reasons to keep living and enjoying your gift of life and through our inspirational programs/ keynotes. Allow our experiences to offer hope to you or someone you know, or at your next cancer survivor celebration or relay for life event. 6 Reasons, principles or actions I recommend to help you with your "Purpose" question! We all are faced or are still trying to define our "Purpose" question, maybe some of you have identifed your purpose and passion in life and are living your dream today, I hope so! For those that are still searching, I ask you to rate yourself from 1-3 on the 6 principles above, 1 being "not happening yet", 2 It's working, and for the high point 3; I'm working my purpose, the 6 Reasons noted above, from my book; It's not about cancer, it's about you, are the lessons cancer taught me on living my purpose and passion in life. I believe you can live your purpose with passion and excitement! Give it some sincere thought, give it a try, conquer your dreams and never give-up! if you need help my book may be of inspiration and motivation to you. order through publisher, no shipping, will autograph to you!